OUR REGULAR GLASS BEADMAKING WORKSHOPS DATES TO BE ADVISED Beginners:.............Intermediate:..........#ENROL HERE ON THE FORM BELOW & Email to info@beadglass.com.au . LEARN HOW TO MAKE GLASS BEADS. JOIN IN A CLASS AND REGISTER TODAY! HAVE FUN AND CREATE BEAUTIFUL GLASS BEADS YOU DESIGN YOURSELF. FOR THOSE WHO NEED A REFRESHER THEN THE INTERMEDIATE CLASS IS FOR YOU! PAULINE DELANEY WILL ALSO TEACH IN PATONGA ON THE CENTRAL COAST A TWO DAY BEGINNER's WORKSHOP. PAULINE IS AN ACREDITED TEACHER AND SUCCESSFUL GLASS ARTIST WHOSE WORK IS CURRENTLY EXHIBITED IN GALLERIES IN THE U.S. & FEDERATION SQUARE GALLERY, MELBOURNE. 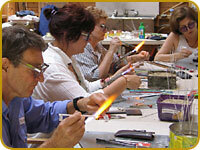 HER CLASSES INCLUDE ALL EQUIPMENT AND TEACH THE FUNDAMENTALS OF GLASS BEADMAKING (LAMPWORK). JUST BRING A NOTE BOOK. GREAT LUNCH, COFFEE AND TEAS INCLUDED.Fully catered lunch each day is provided. We will stop for a lunch break and take in some inspiration from the beautiful surrounds of the natural environment. Patonga is a unique seaside village surrounded on one side by the beach and a river on the other side. It is located within the spectacular Brisbane Water National Park. Accommodation can be organized for those wanting to stay nearby. REFRESHER INTERMEDIATE LAMPWORK CLASS also available on application and will be included with the Friday Intermediate class.. ALL EQUIPMENT PROVIDED NO CHARGE. BASIC SAMPLE PACKS OF MORETTI GLASS INCLUDED. ANY ADDITIONAL GLASS COLOURS IF REQUIRED WILL BE AVAILABLE FOR PURCHASE. THE TECHNIQUES USED IN FORMING A BASIC ROUND BEAD FROM MORETTI COLOURED GLASS RODS. REVISION OF STRINGER TECHNIQUES AND CONTROL . USING COLOUR COMBINATIONS, ENAMELS AND REACTIONS IN DESIGN. SILVER/GOLD FUMING & HOLLOW BEADS. (Please circle payment options: Direct Deposit, Cheque, Credit Card , COD, Cash ). If paying by D.D. details will be emailed to you. DEPOSIT for all classes 50%, IS REQUIRED TO SECURE A PLACE AND FINAL BALANCE PAYABLE ON THE DAY OF THE WORKSHOP. DEPOSIT MONIES ONLY RETURNED IF WORKSHOP IS CANCELLED. PAST INTERNATIONAL TUTORS FOR BEADGLASS CLASSES HELD THROUGH OUT AUSTRALIA HAVE BEEN: 2010, ANDREA GUARINO and in 2009, JAMES SMIRCICH....and now..HOLLY COOPER APRIL, 2013 and MAY, 2017! This special invitation, as promised, is now open ... so don't miss out on the first choice for dates and locations. # Please email back early so you don't miss this exciting opportunity. #Incremental payments during the year will be available as arranged in previous years.